Now save time and money with online booking for your international shipping to Bangladesh. Bangladesh is one of India’s bordering countries. Relationship between India and Bangladesh has considerably improved after the prime minister of Bangladesh’s visit to India. It is one of the densely populated countries with widespread unemployment. As a result most of the people from Bangladesh come to India for employment purposes and have settled here. There are various reasons why you want to send a parcel to Bangladesh ranging from business purpose to sending a gift or item of necessity to a loved one, courier force makes it to be your best experience by giving you discounted prices and high class service. Courier Force assures you that your parcel delivery or business delivery will be collected and delivered safely and in time. Courier Force works with the best courier companies in the market like TNT FedEX, DHL to give you service that suits your budget. We have all the experience and knowledge in the field to provide solutions to all your logistics needs. Our team members are always ready go the extra mile and get you the cheapest prices in the market. We also have live online help team to cater to all your needs in no time. The courier process is simple where you can simply request an online quote for your shipping to Bangladesh and if all goes well then we can arrange for you with a completely free door to door service where your parcel is collected from your preferred location at your preferred time and reaches the destined location at the time when you want it to reach. 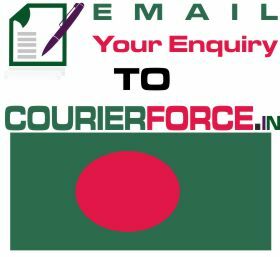 Get a quote today from Courier Force for your international shipping to Bangladesh. Prices below are door to door courier rates to Bangladesh from India. These charges are cheapest in India for sending courier to Bangladesh from India. This is by a courier company which is the best in industry for parcel services to Bangladesh. 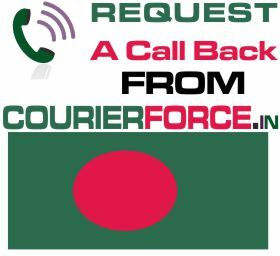 Again, Courier Force is one of the very few companies who have their own network for distributing parcel in Bangladesh. It will take anywhere between 3 and 6 working days to deliver your parcel to Bangladesh from India. We will be simply collecting the parcel from your business or residence in India and delivering it to your destination address in Bangladesh. Duties, taxes and customs charges if any (in Bangladesh) will be additional.